WebAnywhere is a browser-based screen reader that can be used on any computer with access to the Internet. 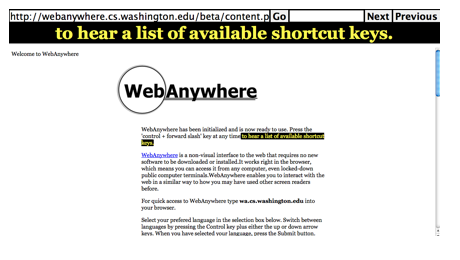 To get started with Web Anywhere, visit https://webanywhere.cs.washington.edu/beta/. On a Windows machine, this can be done without any assistance by pressing Control R and entering the WebAnywhere web address. WebAnywhere will then open in the default browser. To open a new page with WebAnywhere, press Control, L to move the focus to the address bar, then enter the address of the site and press Enter or Return (depending on your operating system). WebAnywhere supports a number of keyboard shortcuts. To hear a list of those shortcuts, press Control and / (forward slash). This will open the WebAnywhere help page. To exit this help page and return to browsing, press the Escape key on your keyboard. Down Arrow: read the next item on the page. Up Arrow: read the previous item on the page. Tab: read the next link or form control on the page. Control H: skip to the next heading. Control I: skip to the next input field in a form. Home (Fn and Left Arrow on a Mac laptop): start reading from the top of the page. Page Down (Fn and Down Arrow on a Mac laptop): start reading from the current spot on the page.